With so many exciting new releases, it’s hard for us to choose which book to giveaway next. So we decided to let you choose! 1) Life In the Balance – The father-son team that authored this groundbreaking book consists of a well respected rabbi and a world-renowned psychologist. Together they present a refreshing view on life – and how to improve yours – drawing from the timeless wisdom of the Torah and the timely wisdom of modern psychology. 2) Living Emunah – Why do thousands of people tune in to listen to Rabbi David Ashear’s lectures on Emunah? Probably because they teach their readers how to live a worry free life. Who wouldn’t want that? You can experience the tranquility and peace that comes along with learning Emunah too…and this book will show you how. 3) We’re All In This Together – Rabbi Yissocher Frand is one of our generations most respected and sought-after lecturers and authors, and for good reason. His clear reasoning, his powerful way of presenting his ideas, his stories and humor – they’re all a part of why tens of thousands of people have been inspired by Rabbi Frand’s lessons. Now those lessons are presented in book form, with essays on timely topics related to the challenges that all of us face. 4) Let There Be Rain – With his Ohr Naava women’s learning center, Rabbi Zechariah Wallerstein has transformed the landscape of torah for women. And now he’s joined forces with one of today’s best-selling Torah authors, Rabbi Shimon Finkelman, to transform your life with a unique perspective on gratitude. Conveniently arranged for daily study, this is a book that will change your life. Giveaway is over! Congratulations to Edwin Maltzman on winning Living Emunah! So which one do you want? Tell us for your chance to win! Comment on this post letting us know which of these new books you would like to win. One winner will be chosen at random and we will send them the book of their choice. **Giveaway ends on Monday, September 22nd at 11:59 pm eastern time. Prize can be shipped within the USA. Winner will be notified via email and will have 48 hours to respond. Valid email address must be provided to claim prize. Limit one entry per person. Make sure you never miss a giveaway, sale, or other exciting news – subscribe to our blog emails using the sidebar link on the right. I would love to win living life in the balance. It sounds like a refreshing view of the world. 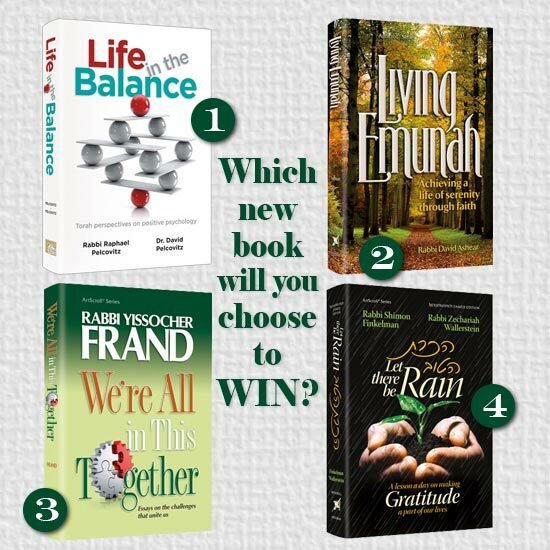 I would love to win “Living Emunah.” My family and I have been going through some turbulent times, and I think the material in this book would really help all of us. We live in a time when there is so much illness and life has so many hazards. We need more books like this one to help us navigate the ups and downs. I would like to win Let There Be Rain. Thank you! Let There Be Rain — because we all need to be a little more grateful for everything HaShem has given us. Let There Be Rain would be a great addition to my collection. Life in the Balance. Thank you! Life in the Balance would be my choice because of the various things that I’m going through. Living Emunah. The more I feel emunah, the more I want to feel more emunah. It’s a wonderful cycle that I’d love to increase. The key to enjoying life. I would love to win, Let There Be Rain. I’d be happy to read any of them, but I think #4 would be my top choice! Hi I would love to win the rabbi frand book on we’re all in this together. I would like to win Life in the Balance. I’ve heard Dr. Pelcovitz speak. He was wonderful. Life in the Balance. I have Purchased the authors other Artscroll books and have become a big fan of the Pelcovitz’s. I would like to win Living Emunah, No. 2 on the list. I need to stop worrying! Would love Living Emunah. I like them all. I picked #4 on FB, so I’ll pick #2 here, and Hashem will choose which one is better for me 😉 Living Emunah it is! I would like to win Let There Be Rain. Let there be rain!!! Rabbi wallerstein!! I would love to win We’re All In This Together . Well, it seems “We’re all in this together”! Hashem has done so much for me in the past year that I hope the book Let There Be Rain would enable me to express my gratitude with renewed insights. They all sound great! I’d love to win “Let there be Rain”. Thank you. We would love to win “Let there be rain.” Hakaras hatov is so very important, especially for a Jew. I’d like to win “We Are All in this Together”. They all look great but I would like to get R’ Yissocher Frand’s “We’re All in This Together.” Thank you and a K’sivah V’Chasimah Tovah!